A Sole Trader is the simplest way of trading and there are fewer formalities to trading this way. The business of a sole trader is not distinguished from the proprietor’s personal affairs so that if there are any debts, you are legally liable to pay those debts. Sole Traders have a legal requirement to maintain accurate accounting records, collect taxes and file tax returns for income tax, National Insurance, VAT and Payroll where appropriate. It may not be a legal requirement to prepare and file formal year end accounts but it is certainly good practice to prepare year-end accounts and is likely to be a requirement for banks and other organisations (e.g. life insurance companies) where a record of income is required. Why choose Piper Hulse Accountants? With more than 40 years experience in large and small industries plus accountancy practice, Piper Hulse has the professional know-how to offer solutions and advice across a wide range of accountancy and business advisory matters. We’re a highly-qualified team and you’ll only ever deal with a senior accountant giving you peace of mind your money matters are in great hands. And, with our range of packages built to suit all needs, you’re sure to find something to suit your requirements and budget. Prices: from £30 to £60 per month, ex VAT. 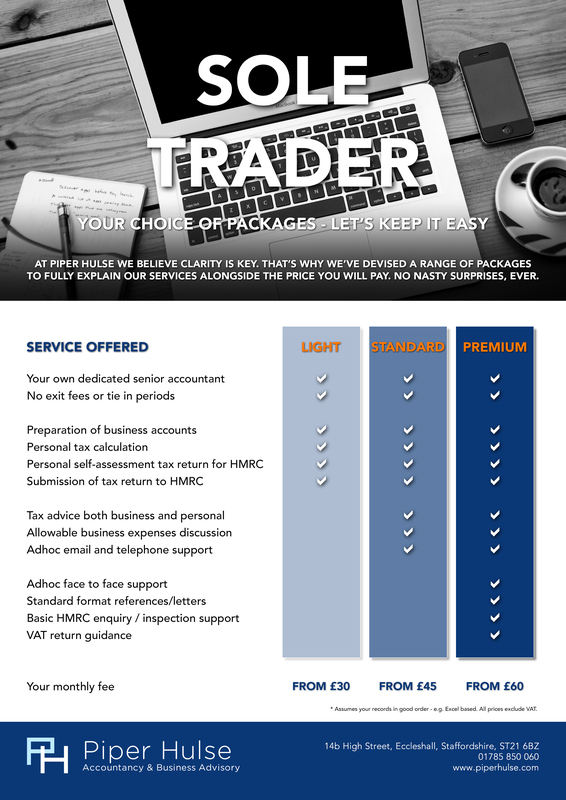 Download a copy of our latest Sole Trader Packages guide here.